As requested by the Commission, TTC staff have commented to Council for its June 8/9, 2010 meeting on the proposed Russell/Knox route from Queen Street to Ashbridge Carhouse. This report appears to take as uncompromising a line as possible on the alternative to a Leslie Street access route. I believe that the TTC has overplayed their hand here, and given yet another example of their unwillingness to fairly evaluate alternatives to their own proposals. This stance has effects beyond the immediate project, and adds to the general distrust of material the TTC places before elected bodies. The comments below should be read in concert with the TTC report. The subtitles below correspond to the sections of that report. The TTC states that it evaluated 11 routes to the new carhouse. However, no detailed evaluation of the “Russell/Knox” route was included in the Transit Project Assessment. It appears here only as a short letter, and only by virtue of the Commission’s direction, not staff’s initiative. At a meeting between Councillor Fletcher, Chair Giambrone, TTC staff and other interested parties (including me) on May 28, there was no mention of a permanent facility for collision repair at Russell Carhouse. When we challenged the long-term need for the “prototype testing facility” at Russell, there was no reply indicating its eventual function, one which appears to have developed in the interim. Why was a collision repair facility not included in the Ashbridge site as this building will take over the major maintenance function for streetcars now performed at Hillcrest Shops? The TTC refers to their master plan for LRV Maintenance, and should be required to publish it. All neighbours of TTC streetcar facilities need to know what is planned for these sites. This entire discussion could have been conducted on a better-informed basis if this material were already in public hands. What is the future use of space inside Russell and Roncesvalles carhouse buildings? From the Russell plans shown by the TTC, they only count the outdoor storage as “capacity”. One question for City budget watchdogs: is the construction of this facility included within the Capital Budget item for the Ashbridge Carhouse, or is this a net new expenditure? Is this another example of TTC project creep? 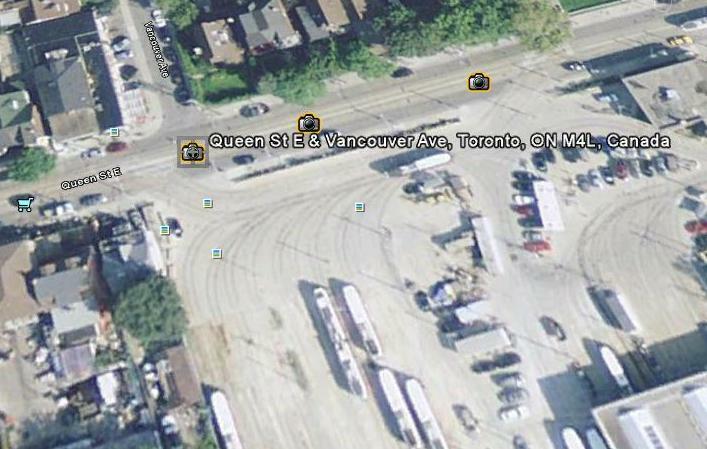 The TTC claims that it must take in full the property on Queen Street just west of the existing exit from the yard. If one considers the east to south curve required for the new connection as following the same trajectory as the existing track, it would not foul the building. The TTC should be required to show a detailed plan of why a full taking of this property is required. This view is from Google Earth, and it clearly shows the exit at the west end of the yard, the three yard tracks that would be taken for the Knox route, and the location of the building in question relative to these tracks. 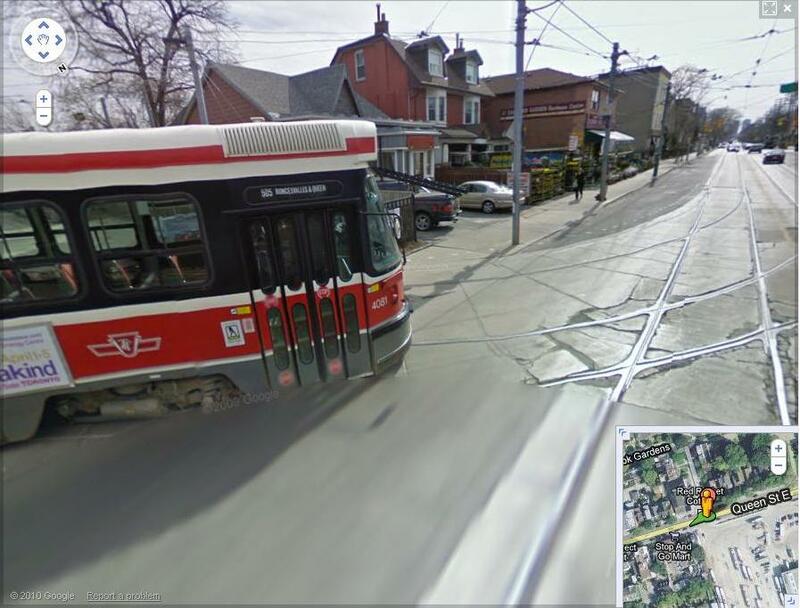 This view is from Google Street View and shows a car leaving the yard westbound onto Queen Street. The tracks which permit this operation will not be available to new LRVs in the future carhouse operations, and all LRVs will have to use the eastern exits from the carhouse. This view shows the western exit from Russell Yard. This view looks directly south at the western property line of Russell Yard and shows how the existing tracks relate to the property next door. It strains credibility that with a slight shift to the east of this junction, a 90 degree turn east to south cannot be installed without requiring taking of the neighbouring property. The TTC claims that two extra traffic signals will unduly slow operations, but their own evaluation of a route via Connaught, Eastern and Knox to the north side of the Ashbridge site claimed that only 1 minute would be added to the trip. Proper signal priority should be capable of moving streetcars through the curves to and from Eastern Avenue in reasonable time. Moreover, the TTC does not consider the delay some of its cars travelling on Leslie will encounter. About 40% of all moves to and from Ashbridge Carhouse will occur other than during the wee hours of the night. Circulation around the Ashbridge site is a legitimate concern, but it was not raised in the TTC’s evaluation of their own scheme to enter the site from the north. 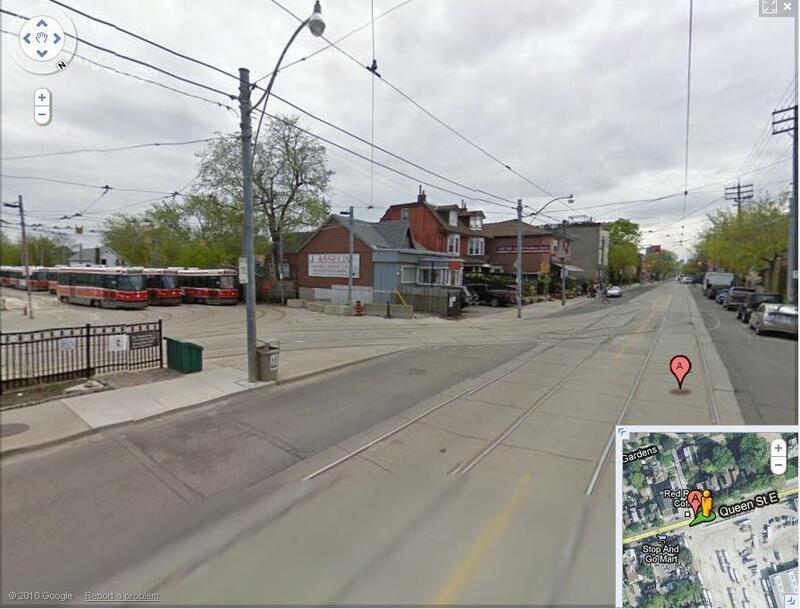 The TTC claims that Canada Post will oppose any use of Eastern and Knox for carhouse access. However, there has been no traffic analysis to substantiate this objection and, moreover, the representative from Canada Post at the recent TTC meeting was clearly confused about which end of his site actually was used by trailer units. In fact it is the eastern end (Woodfield Avenue) where the trailer bays are located, not at Knox. At a minimum, the TTC needs to validate claims of traffic interference and confirm which of Canada Post’s operations, if any, would actually be affected. I must ask how TTC streetcar movements on Eastern and Knox would so disrupt Canada Post and yet not have comparable effects a block away on Leslie Street for general users of that street. The TTC claims that the Martin Goodman Trail, a cycling road on the south side of Lake Shore, would be forced to cross streetcar tracks curving into the new carhouse site. This would be unsafe as bicycles don’t do well with streetcar tracks that are not crossed at 90 degrees (as they would be for the Leslie alignment). First off, it is odd that the TTC has now discovered the safety problems inherent in streetcar tracks and cycling, but does not address the issue of shared use of roadspace on Leslie Street. Second, the location on Lake Shore where the Knox trackage would cross is one where there is a median that disappears to the east. If the eastbound lanes of Lake Shore were to swing north to the west of Knox rather than further east as at present, there would be plenty of room for the Martin Goodman trail to cross the tracks before they begin to curve into the TTC site. The report of TTC actions at the June 2 Commission meeting and the original post on this topic follow the break below. 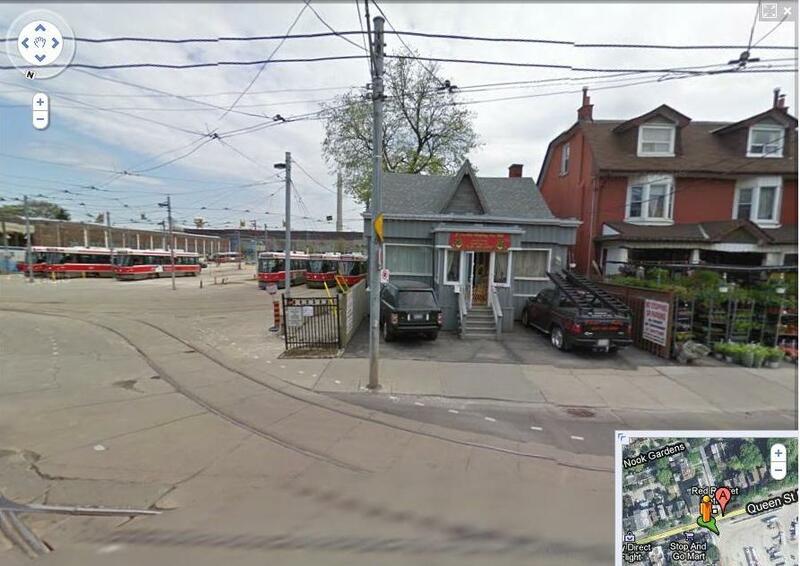 On June 2, the TTC considered the matter of Ashbridge Carhouse including the site, possible routes to the carhouse and the associated Transit Project Assessment Report. To consider the addition of a second access route for the Ashbridges Bay MSF and to report to City Council on the Knox/Russell/Eastern route. To meet with stakeholders to ensure appropriate mitigation for the Leslie Street route. To direct staff to report back on changes proposed to the Russell Streetcar Facility to accommodate the new LRVs and to consult with the public on the impacts and mitigation measures of the changes. To ensure design excellence for the site and also the route; and to include a greening strategy on Leslie Street to Queen. To establish a construction liaison committee for the site and the route. Those who oppose the site entirely. Those who accept the site as a future carhouse and maintenance shops, but who object to the use of Leslie Street as the access from Queen Street. Those supporting an alternative route from Queen that was not included in the TPA Report. This is the route through Russell Yard proposed by me (see below for details). This has been a contentious matter for some time, and many residents spoke with a sense of frustration at having their concerns downplayed or ignored by project staff. For its part, the TTC regards the project as urgent so that the new facility will be ready in time for delivery of the first of the LFLRVs in 2013. During discussion of the Russell Yard proposal and other matters, it was clear that there is some reluctance to overrule staff, particularly at this late stage in the process, and that some of the detailed issues are not well understood by Commissioners, many of whose wards are nowhere near the Russell or Ashbridge sites. Councillor Fletcher and Commissioner Bussin’s wards meet on Leslie Street, and they share a direct interest in whatever is decided here. I will not reiterate my arguments here as they are summarized in my deputation. A representative appeared for Canada Post Corporation because their South Central facility, the largest of their plants in Canada, lies in the large block bounded by Eastern Avenue on the north, Woodfield Road on the east, and Knox Avenue on the west. They expressed concern that streetcar operations on Knox would interfere with truck movements in and out of their plant, and especially were concerned about trailer operations. However, the Canada Post rep seemed to get his directions askew when talking about their trailer yard which is at the east (Woodfield) end of the building. This is not the end of the Canada Post site where streetcars would run. Instead, they would run via Knox Avenue at the other end of the building. In response to claims that there was a great deal of traffic on this street at the same time as the TTC’s morning service buildup from 0600 to 0700, I stood at that location for an hour this morning to record what actually happened. There were some Canada Post trucks at Knox, but hardly a flood, and many that came along Eastern Avenue used the Woodfield Road entrance. You can read the details in my log. The primary source of traffic on Knox is postal employees arriving and leaving work as there is a shift change at 0700. One of the local residents, speaking of the wildlife nearby, noted that a beaver had been sighted crossing Leslie Street from the Tim Horton’s to Loblaw’s. This is clearly an urban beaver. In keeping with this holistic view of the neighbourhood, and because an hour of watching for a mythical traffic jam of postal trucks gets boring, I included notes about some other passersby. It is unclear whether the representative from Canada Post was properly briefed before he made his presentation, but my opinion is that he spoke to a proposal that was not, in fact, on the table. When TTC staff report on the Russell Yard option to Council next week, we will see how they characterize the Post Office traffic. Notably, when they had their own Knox option in the TPA, they did not mention this as a possible impediment. On June 2, 2010, the TTC will consider the Transit Project Assessment Study for a proposed new carhouse and shops near Ashbridge’s Bay at the southeast corner of Lake Shore Blvd. E. and Leslie Street. This project has gone through much debate and public consultation. Leslie from Queen to Eastern (one block south) is largely a residential street and a large number of streetcar movements to and from the carhouse will occur overnight. A new “T” junction will be created at Queen Street where there is a Seniors’ residence on the northeast corner. This will be a source of noise not just from cars turning, but from all-day service through the intersection. This effect was not addressed in the Transit Project Assessment. Leslie is a major cycling route to the waterfront. Addition of streetcar tracks creates a constraint for cyclists using the road where none exists today. When the TTC studied alternative routes to the carhouse, one option they proposed ran via Connaught (the east end of the existing Russell Carhouse), Eastern (the south side of the Russell site) and Knox Avenue to reach the new carhouse. Elimination of the need to widen the south end of Connaught where only a single southbound track now exists. Isolation of traffic bound to and from the new carhouse from operations at Russell Yard and Connaught Avenue. Provision of a shorter route from Queen to the new carhouse than either the Leslie Street or the TTC’s Connaught options. The major offsetting issue is that this would take space from Russell Yard that reduces the overall system capacity to store streetcars in the future. Another possible route studied by the TTC was to connect via Coxwell and Lake Shore. Although this link could be improved by comparison with the version the TTC proposed, it still has significant problems notably the heavy use of Coxwell by cyclists to reach the waterfront, and severe traffic congestion during special events in the area. As a backgrounder to this discussion, I prepared an article detailing the issues with each of the options. TTC Staff are expected to support their preferred Leslie Street route to the carhouse at the June 2 meeting. How the Commission responds remains to be seen. There is some irony in the fact that the City’s Executive Committee recently overruled a TTC recommendation regarding the proposed link between the Sheppard East LRT and the Scarborough RT/LRT. Staff proposed an on-street link via Progress to Sheppard over which fewer than 20 SRT trains would have operated daily. The Executive Committee directed that an underground connect be used, at an estimated cost of about $65-million, to spare effects on residents and a cultural centre on Progress Avenue. There is a direct analogy between the two situations, and the amount of streetcar/LRV traffic proposed for Leslie Street is much greater than for Progress Avenue. At the TTC, there is a strong desire to have this issue settled so that the project can be forwarded to Council for approval before the summer break and the inevitable hiatus in work during the fall election. The purple lines show the carhouse site. This map shows details of the Russell Carhouse site. Blue box: The area to be repurposed as a northsouth route through the west end of the carhouse property. Red box: The existing junction between the yard and Queen Street at Vancouver which must be restructured to link with the new tracks. The new intersection here would match what is proposed for Queen & Leslie by the TTC. 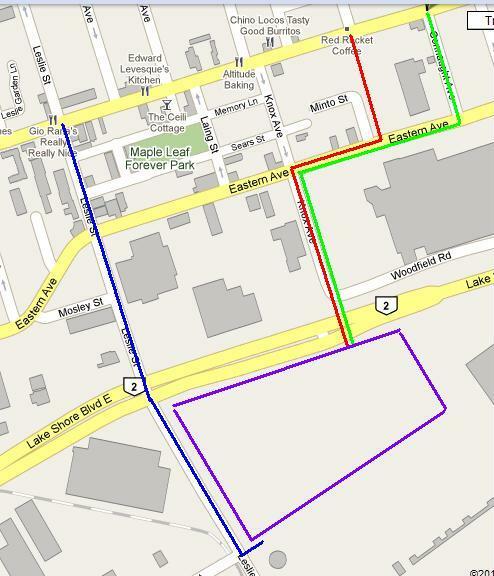 Orange lines: The Russell/Knox route including access to Queen both ways. Green box: The space intended initially as a prototype testing facility which will later be available for LRV storage. Won’t the new streetcars smell bad if they are stored next to a treatment plant? I can’t see the TTC using a link through the west end of Russell Carhouse. Surely they want to keep as much capacity in their yards as they can, so why make a couple tracks into a through route when they can use nearby streets instead? So…How do they plan to address the noise issue that the Seniors Residence will obviously experience? Maybe as part of the plan Council agrees to move in to the residence once they’ve reached retirement age? In the west end, Copernicus Lodge is over the fence, next to the Roncesvalles carhouse. Copernicus Lodge is also a seniors residence. The Roncesvalles carhouse was there first since 1923, and Copernicus Lodge was built on the property of the prior Toronto Railway Company carhouse (1895) as well. I just think there are people who are just looking for excuses not to any kind of facilities for streetcars and/or light rail vehicles. Steve: In this case, the seniors’ home was there first. The TTC study looks at the noise effects on Leslie from carhouse movements, but not at the added noise and vibration caused by the creation of a new streetcar intersection at Queen and Leslie over which all 501/2/3 service plus carhouse moves to and from Russell will travel. At the very least, they need to do measurements at “modern” intersections such as Queen and Church which have the latest of sound-deadening technology in the track and road structure to establish what should be expected at Queen and Leslie. I’m glad to see council being sensible. I’m just shocked that anyone was whining about putting streetcars on Leslie! Especially given that the Waterfront plans already call for LRT along this route. Given that this type of development gives the community the kind of great jobs that Walmart wouldn’t be bringing, I’d have thought everyone who was against the Walmart would have been jumping up and down with joy. I guess more than anything else, it just shows that people are going to primarily be concerned about their own immediate impacts, with little thought for the greater community. The implication is that much of the Walmart debate was just NIMBYism wrapped in all the right politically-correct cloth. I’m a bit concerned that there isn’t a second connection though. If there’s a major accident at the Leslie/Queen or Lesle/Lakeshore intersection at the wrong time of day, transit for much of the city will be impacted. Hopefully in the long-term, some of the Waterfront LRT routes will take care of this. With regard to the intersection of Queen and Leslie they might try a European style intersection. Most street systems use a shallow flangeway when crossing diagonal trackage, much quieter. What’s done is done, Leslie Street is the LRV route of choice and approved by City Council. What worries me is what (if anything) will now happen to Eastern Avenue after the G20 Summitt Jail is gone? Somehow I think the LRV line running up and Leslie Street makes it very difficult and less attractive for any business or residential development on that site. Maybe had SmartCentres developed that site it would have been better then the devil we don’t know? Of course this was a foregone conclusion. So I especially want to extend my thanks and appreciation to Steve for giving this some much needed attention and light-of-day (not to mention a great deal of his time and energy). Although I disagree with some of his conclusions (his support of the site itself), he obviously has given this much thought and consideration, and has proven himself to be a fair and reasoned individual – which is saying a lot these days. My predications are that, once the traffic implications are realized on Lakeshore, Eastern and Queen (all of which are major thoroughfares), there will be a great deal of public pressure to build a tunnel – at least under Lakeshore. Makes the mind boggle that the same group that demands a tunnel on Progress Ave (which is largely an industrial sidestreet) for 20 streetcars, poo-poos the idea on major thoroughfares which will see well over 100. And we will be left to deal with the resulting problems piece-meal due to a lack of adequate planning, and the resultant costs will probably push the total over what it would have been if they had chosen a more appropriate site, and routes, in the first place. Aside from the obvious concerns residents have over this facility, in my opinion what is a great deal more important is the obvious abuse of process that saw this “done-deal” presented to the community for “consultation”, using our own tax dollars to insult us and force something on us that had virtually no consideration for the welfare of the communities/wards in which it was located. Well, perhaps the only good that will come of this is that the citizens of Ward 32 (I can’t speak for Councillor Fletcher’s ward) will finally organize enough to change our representation at City Council. It seems, based on recent comments in the media, that local residents equate the abuse of process re: this facility with similar abuse of process re: the Tuggs contract. As we’ve seen here, all the technical considerations of gauge of track, intersection sound dampening technologies, turn radius implications, route planning options, etc… are just diversionary sleight-of-hand tactics when the result was a foregone conclusion before they were ever considered. So I hope that the constituents in all affected wards (including Mr. Giambrone’s) will exercise their democratic responsibility and vote out any bum who thinks that citizens are there for their benefit, rather than the other way round. We have all been let down by our Councillors and I agree 100% with Anne’s comments and support her call for change in our representation at City Council and especially in Wards 30 and 32. Thank you Anne for speaking up. If there is going to be collision repair at Russell, what are the implications for noise, fumes and runoff from that activity over and above existing activities? I would have thought that the appropriate place for collision repair would be Hillcrest, since presumably the lack of low floor bays should those be needed will be just as much an issue at Russell as at Hillcrest, and will not impose a new usage on the area? Steve: It is unclear why this facility was not included at Ashbridge, although I suspect I know what happened. After the Ashbridge site was chosen based on an available size of 22 acres, the TTC discovered that 4 acres could only be used for parking because it was on top of a major water into the treatment plant next door. This may have caused the repair building to be downsized. Hillcrest does not work because the bays are not suitable for long vehicles with roof-mounted equipment. The ideal site would have been Lever Bros. by the Don River, but it became available only recently. “Available” means “does not contain jobs”. The site’s owner does not want to sell and expropriation would be required. Just one data point, if you are upstairs (not on the roof – but inside) at Murphy’s Law (NW corner of Queen and Kingston), the vibrations are very noticeable when streetcars turn East to North. This is a relatively newly rebuilt intersection – and not even at 90 degrees. As far as the Eastern Ave site goes, it’s going to be vacant for a very long time. In the diagram of Russell Carhouse there are a number of tracks missing. Is this an error or are they actually removing tracks? That would seem an odd thing to do when they’re already supposed to end up with storage space constraints for a while. Steve: They are not removing tracks. The drawing is light in places, and I think it’s missing details. 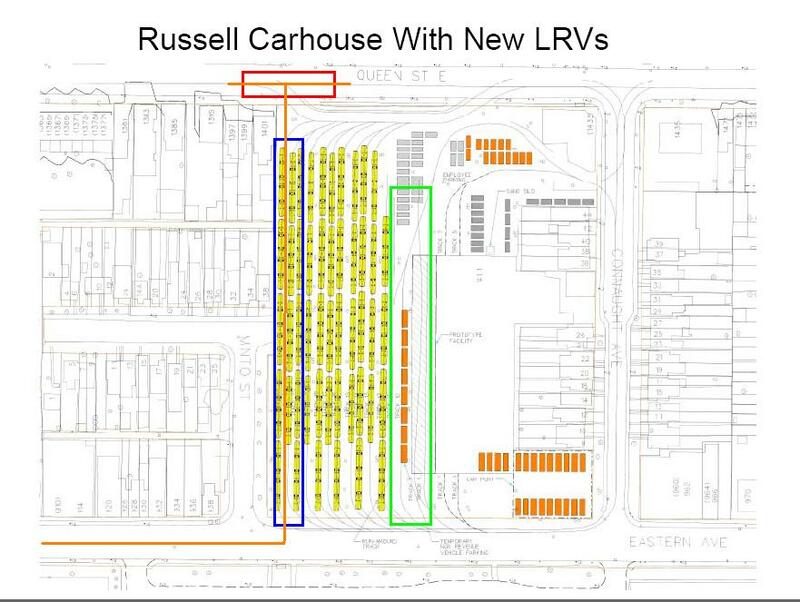 The main change in usage after the CLRV/ALRV fleet is retired appears to be that they won’t use the carhouse building for storage. Why I don’t know. I experienced Leslie/Lake Shore last night. There are an awful lot of signal heads at the intersection already, as there are multiply-multiple bike signals, as well as the multiple installations of elaborate traffic signals. It may not be as obvious during the daytime, but after dark, it’s like being in a christmas tree lit with old-fashioned colour bulbs. If transit signals were added to the existing cornucopia in The Usual Elaborate Way … I fear that the intersection will hit a traffic signal singularity and likely implode to a black hole. Steve: I believe it will actually be used for signalling civilizations on other planets who, if they are smart, will take one look and avoid this part of the Earth. Indeed it is possible that the entire, elaborate “priority signalling” for our streetcar lines is actually a complex communication tool that only co-incidentally manages the transit service. This would give the TTC yet another explanation for why service is impossible to manage … “the message we are trying to send causes bunching”. “Leslie Street Spit will get a $8 million upgrade. Leslie Street Spit will be home to an upgraded ecological research station and interpretative area, among other additions to the man-made headland, which extends the city’s east end into Lake Ontario for approximately five kilometers. “The Leslie Street Greening project is creating a generous green corridor connecting the neighbourhoods to the north of Lake Shore Boulevard to the Port Lands and its emerging park system including Tommy Thompson Park and the future Lake Ontario Park. The improvements to Leslie Street will run from Lake Shore Boulevard to Unwin Avenue, and include rebuilding the existing Martin Goodman Trail, the introduction of continuous sidewalks along both sides of Leslie Street, the addition of trees, shrubs and ground cover to create an attractive and safe, landscaped corridor for pedestrians, bicyclists and in-line skaters. The enhancements also feature bio-swales – landscape elements designed to remove sediment and pollution from surface runoff water for the drainage of the roadway. Completed in 2007, Phase I of the work included the west side of Leslie Street between Lake Shore Boulevard and Commissioners Street and the eastern frontage south of Commissioners. Is this a case of the right hand not knowing what the left hand is doing, a complete lack of vision or urban planning in our city, city “planning” run amok, or just a lack of oversight which allows two separate city initiatives to shoot one another in the foot? That was funny! You’re a very witty guy. Perhaps you might be induced to run for City councillor in ward 32? Anne, I’m pretty sure the carhouse design take the Leslie Street Greening project into account with its large green space along Leslie. I don’t think the project envisions preventing anything from being built on Leslie as creating new workplaces is an important part of the waterfront redevelopment. “Fletcher also expressed her unease with the physical impacts of the facility on aesthetics of the Leslie Street and Lake Shore Boulevard area. I fail to see how any initiative that would cut down every mature tree, every bush, and remove every single blade of grass, in order to lay down asphalt from property line to property line to property line to property line, in the middle of a major migration route and next door to two major parks and recreation areas, could ever be considered anything but antithetical to any ‘greening’ initiative. There are any number of initiatives that would be fitting here. This isn’t one of them. Steve: It is self-evident that any conversion of what is now open space, whether it is officially “green space” or not, to an industrial use cannot possibly be as “green” as what is on the site today. That said, the claim that the TTC will pave the site to the lot line misrepresents the stated intention of landscaping the perimeter, and does not account for the benefit, such as it might be, of any green roof on the carhouse. If this change represented a major removal of green, open space from the area, I might be tempted to agree with the way you have presented the issue, but that’s not what is going on. Yes, we can lose green space to a “death of a thousand cuts” planning policy, but there is no indication that other current green spaces in the neighbourhood are earmarked for conversion to buildings or pavement.